When I was six, my family moved to an old house where layers of peeling wallpaper suggested the tastes of people from different times. Red linoleum and green carpet covered wood floors. We had a dumb-waiter, window seats, and an attic where boxes of chipped vases, worn-out skates, and old books had been left by previous owners. The stories about saints and poems about dogs weren’t always great, but I loved the smell of paper with crumbling corners. Soon I started writing in a blue notebook. None of my poems, stories, or beginnings of plays were astonishing, but I was happy to live for a while in a world I made myself. I still like an old thick book, but the number of fragile pages doesn’t always add to my sense of knowing someone. I read old biographies as carefully as I’ve looked through boxes at long-folded notes, old report cards, photographs, drawings, schoolwork, and musty clothes that might fit no one. Just as the boxes hold junk and an occasional revelation, many biographies or collections of letters seem too general, but hold a few details to dust until they shine. 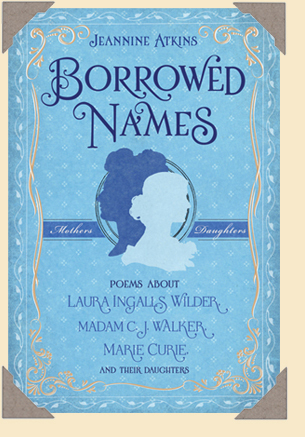 Reading biographies led me to discover that Laura Ingalls Wilder, Madam C. J. Walker, and Marie Curie were all born in 1867, a year when laws regarding race and gender were changed or challenged, and creativity flourished. All three grew up to make their marks at work in different fields and became mothers of daughters. Both Laura Ingalls Wilder and her daughter Rose Wilder Lane achieved fame as writers, but Laura tended to idealize her childhood and was proud of the family farm, while Rose summarized her childhood as sad and preferred cities and traveling to life in a small town. They spent many years apart, but eventually Rose returned to work with her mother to create books based on her mother's childhood. Those books including Little House on the Prairie are beloved as examples of how faith and work can overcome hardships, like the true story of Madam C. J. Walker’s rise from doing laundry for poor pay to creating a hugely successful business. Her only child, A’Lelia, didn’t have her mother’s zeal for marketing, but she had a gift for bringing people together, particularly to celebrate the creativity of African Americans. Marie Curie is probably the best known woman scientist, winning two Nobel prizes for her discovery of new elements. I focused on her relationship with her daughter, Irène, who often worked by her mother’s side as she carried on research that changed the world. In Borrowed Names, I wanted to show not only the difficult paths toward achievement and celebration, but ordinary moments, too: turning points that most of us face, such as leaving or returning home, and themes of anger, forgiveness, longing, judgment, ambition, faith, and disappointment. I looked through biographies for scenes and objects that pulled me closer: the green felt of a handmade writing desk, a hard bar of laundry soap, miniature jade elephants, and green butterfly nets. When facts failed to answer questions, I let in imagination to coax out what seemed hidden behind surfaces. I hoped each poem could stand alone, but also together suggest the shapes of lives and the connections among the different daughters and mothers. And I hope those who read about these girls and women may recognize parts of themselves, too. To read more about how I came to write Borrowed Names visit, "Scrap by Scrap: Writing Poems from History". I hope reading this book will inspire you to write poems of your own! You may want to choose someone from history you admire and are curious about. While researching facts about the person’s life, note cherished places and things. You might list sensory elements about places she or he returned to. Describe as particularly as you can things the person used at home or at work. Perhaps these details will open another view to the person beyond the facts of what made her famous. You might try naming an object at the beginning of the poem then finding new words for it at the end, showing a changed relationship. Or did a place first seem one way, and different later? Or try writing a Letter Poem. Begin with close observation about what you see and hear around you at the moment. Then, addressing your subject as “you,” ask questions, or make speculations. Tell him or her what you admire or wonder about or even what makes you angry. Imagining the person as still alive, what do you envision her seeing and hearing? Write that down. Three is a good number, so here’s one more way to begin a poem, especially if you want to try mixing history with a bit of magic. You’ve researched a person. Now begin your metamorphosis poem with the words “Never before.” Then write about your subject turning into something or someone else. Have fun! To purchase Borrowed Names, please visit your favorite local bookstore or use these links to Indiebound.com or Amazon.com.